10GB per line, plus incentives for you to get DirecTV. Remember when AT&T announced that it would once again offer unlimited data packages, and they were a little underwhelming? Sensing its error, the company has taken the opportunity to roll out a tweaked plan to ease the pain of your wallet. AT&T Unlimited Plus offers unlimited calls, texts and 22GB of high speed data before you hit the throttling wall for $90 a month. Even better, the plan now offers 10GB tethering data per line -- something that was omitted from the prior set of plans. AT&T's also keen on tying folks in to both its mobile and TV packages, with juicy incentives for those who pay for both. Subscribers to Unlimited Plus will get a $25 monthly credit towards their DirecTV, DirecTV Now or U-Verse TV packages. In addition, AT&T is proud to offer zero-rating for its video packages, so if you watch DirecTV Now on your mobile connection, it won't count against your data. Naturally, the pricing schedule is increasingly complicated the more lines you pay for, but you can get four lines for $185 a month. You can also add on other devices, like a tablet, wireless home phone or hotspot, for another $20 a month. For most people, the easy calculation is that you'll get the main data plan and DirecTV now for $100 a month once you've taken credits and incentives into account. The company is also rolling out an unlimited data plan without the extra bells and whistles, so long as you're happy with capped speeds. 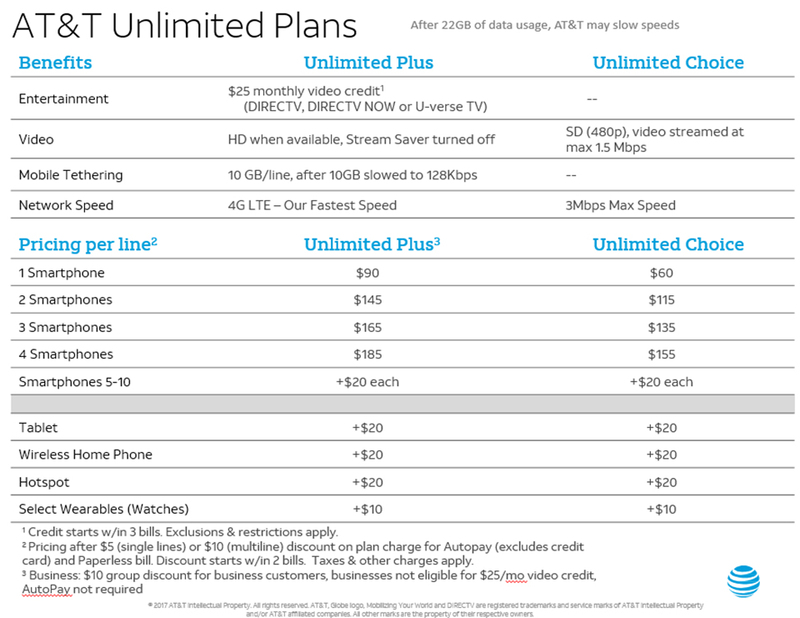 AT&T Unlimited Choice will set you back $60 a month (for the first line) with the speed limited to 3Mbps and video held at 480p resolution. Both plans however, will allow you to roam into Canada and Mexico without incurring additional charges.